The Detox Strategy: Vibrant Health in 5 Easy Steps was written by Certified Nutritional Consultant, Brenda Watson, who is also the bestselling author of The Fiber35 Diet: Nature’s Weight Loss Secret. Watson says that toxins might be to blame if you are low on energy, dealing with chronic illness or having trouble losing weight. In this book she introduces readers to her RENEW program (Reduce, Eliminate, Nourish, Energize, Wellness), which offers a holistic approach to eliminating toxins, reversing the aging process and rejuvenating the body and mind. According to Brenda Watson, when you have a high level of toxins in your body, this can make it difficult for you to lose weight because your metabolism slows down, and you are less likely to feel satisfied during meals, which causes you to overeat. The first step in the Detox Strategy is to avoid exposure to toxins from your food and environment. Using a water filter for your drinking water, eating organic foods and keeping plants in the house to purify the air can help you to achieve this. You can also cleanse the body of accumulated toxins with herbs, nutritional supplements, colonics, steam baths and saunas. Next you will start eating a diet that nourishes your cells and supports your body to eliminate toxins. Freshly squeezed vegetable juice and wheatgrass juice provide valuable nutrients in a form that is easy to absorb. Watson also provides lists of specific foods, such as those containing soluble fiber and phytonutrients, that enhance different aspects of the detoxification process. The book includes detailed detox plans, starting at six weeks for the Total Basic Body Cleanse, up to an advanced fourteen-week program, which includes an optional Liver Cleanse and Heavy Metal Cleanse. The basic diet remains the same for all of the cleanses, with the major difference being adjustments to the herbal and nutritional supplements for each phase of the program. Apples, blueberries, raspberries, plums, cranberries, carrots, beets, cauliflower, sweet potato, mushrooms, spinach, lettuce, asparagus, broccoli, cilantro, parsley, lentils, oat bran, brown rice, flaxseeds, walnuts, almond milk, tofu, eggs, salmon, organic free-range chicken, turkey, whey protein, tamari, extra virgin olive oil, wheatgrass juice, herb tea. Exercise is recommended because it can help reduce stress, improve sleep and enhance flexibility. If you are not currently physically active you are encouraged to commence with gentle aerobic exercise, such as walking, and gradually increase the duration and intensity. It can also be beneficial to workout with resistance bands to improve your muscle tone and strength. 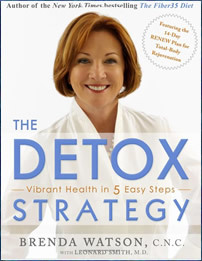 The Detox Strategy: Vibrant Health in 5 Easy Steps retails at $26. Encourages a high intake of fresh produce and other natural unprocessed foods. May improve a variety of chronic conditions such as fatigue, digestive disorders, headaches, arthritis and sinus problems. Includes sample menus and recipes. Provides specific detox programs for cleansing the liver and eliminating heavy metals. Offers a gentle approach to detoxification. Based on proven scientific principles. Requires the use of a variety of herbal and nutritional supplements. Will involve a fair amount of time for food preparation. Requires elimination of caffeine and alcohol. Many dieters will experience uncomfortable detox symptoms such as headaches and fatigue. The Detox Strategy provides detailed information about toxins and outlines a comprehensive lifestyle plan, using principles supported by scientific research, to cleanse and detoxify the body. Brenda Watson’s Renew Program will appeal to dieters who have failed to achieve the expected improvements, in regards to both health and weight loss, with conventional methods.